This topic contains 14 replies, has 9 voices, and was last updated by E. Vinje 2 years, 9 months ago. Tomatoes, what kind is the coolest? Okay, so I have recently become obsessed by the idea of finding the best heirloom tomato. What is everybody’s favorite? It should taste good, grow well, and look awesome! Something to really shock the neighbors. Alrighty! When you're talking about tomatoes you need to know what you're looking for. There are two basic kinds: Indeterminants and determinants. Indeterminants are often taller and continue to grow, fruit and flower until frost. 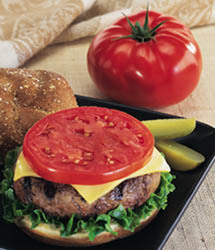 Early Girl and Burpee's Burger are two popular examples. Determinant tomatoes are often shorter and bushier and are great for growing in containers. Northern Exposure and Sweet Tangerine are two popular determinants. In my garden, Oregon Spring and Forth of July are usually the first two varieties to reach maturity. They also get major bonus points because they taste great! Early Girl and Sungold (a yellow colored cherry tomato) also receive rave reviews. By the way, you can't beat the flavor of a Sungold tomato. I'm pretty sure all of these tomatoes will grow well in the Pacific Northwest. Just remember, tomatoes crave rich, well drained soil, consistent heat (a south facing wall works great), and plenty of sunlight. Give them the love and care they need and your tomatoes will be the talk of the neighborhood. great! What dose a Burpee look like? That is a big shiny tomato! What do you think of the more exotic kinds like green zebra or hilbilly? are they worth growing or do they just look pretty not taste pretty? Green Zebra's – Hilbilly's? I've never heard of them … although I might stop drinking if I ever saw one in my garden. yes, both Hillbilly and Green Zebra are well worth growing. As another exotic, you might like "Paul Robeson". This is a very dark, dusky almost black tomato that origninated in the Soviet Union. The taste is just as exotic/different as the color. There are those who argue Paul Robeson may be the finest tomato though there is, of course, no universal agreement on that point!! I'm trying both Green Zebra and Paul Robeson this year. Stay tuned. They named a tomato after an Opera singer? That is so rockin awesome! I'll have to find someone who is growing them around here to give me a taste. Hey there… we've just moved to the Texas Hill Country and while clearing some brush on the property, I've run across some tomatoes growing. I thought before the deer eat them all up I would containerize them up on the porch. How far around the base should I dig, how deep and will I inevitably kill these wild girls? Has someone, here, experience raising the Cherokee Tomato? I am starting some of the seeds. A tomato that looks like a pepper! Great for stuffing. Wonderful yellow tomatoes that will inspire plentiful oohs and aahs. At first glance, you'd swear it is a yellow bell pepper, with a perfect pepper shape and feel. But it's very much a tomato, making a tasty conversation piece when stuffed with your favorite salad. Suitable for either appetizers or entrees, 'Yellow Magic's' walls are uniquely firm, thin and tasty, so preparing them is a pleasure. The mature fruit grows to 4" wide. A delicious and welcome addition for both gardeners and magicians. Sorry, plants CANNOT be sent to AK, AZ, CA, HI, or NV. I grow these from seeds and stuff em w tuna salad and there is no debate with neighbors or workers, these are by far coolest tomatos you can grow. The best coolest tomato is of course the green zebra!!!! This tomato is an eye catcher. I make salsa with it and the orange blossom and it is really good and is cool looking. I love trying all the different looking tomatoes. The striped german is good too, just hard to grow, it seems to get end rot pretty bad. So much sweeter, juicier and extra flavorful than a commercially-raised tomato, homegrown heirloom tomatoes restore one of summer’s greatest pleasures. We offer several unique varieties here.